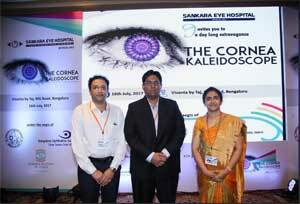 Bengaluru: Sankara Eye Hospital, the leading provider of quality eye care in the country organized ‘The Cornea Kaleidoscope’, a one day scientific extravaganza, which witnessed participation from more than 200 doctors across the state. The one day event aimed at providing a platform to interact and learn from the stalwarts in the field regarding concepts, preferred current practices and recent advances in the ocular field. The session provided practical information regarding concepts, diagnosis, surgical tips and management of ocular diseases in an interactive way to all the practicing ophthalmologists and upcoming post graduate students who attended the event. Some of the interesting topics include – Tackling dry eye disease: the major cause being usage of smartphones today, Keratoprosthesis: replacement of diseased cornea with artificial cornea, The Future of Artificial Cornea & its Indian experiments along with a demonstration and hands on Scleral contact lens fitting. “We are overwhelmed with the response received for the event. The Cornea & Ocular Centre for Excellence at Sankara Eye Hospital, has dedicated and qualified consultants who are experts in providing treatment and quality eye care from simple dry eyes to complex corneal diseases. The session has certainly given more insights into the various unexplored aspects of eye care treatment, how we can make a difference and the recent technology advancementsin the field”, said Dr Pallavi Joshi, Consultant – Cornea & Refractive Services, Sankara Eye Hospital, Bangalore. “The scientific extravaganza has been a highly successful event today and we are certainly looking forward to organizing similar events that will help in knowledge sharing and deeper understanding of the opportunities and challenges in the field. Sankara Eye Hospital has a well-equipped eye bank for processing and harvesting eyes and have been instrumental in performing sight saving treatments for a variety of corneal diseases”, said Dr Anand Balasubramaniam, Senior Consultant – Cornea & Cataract, Sankara Eye Hospital, Bangalore.